The cherry tree in our garden has been prolific this year and I have been productive in an attempt to beat the birds to the fruit. 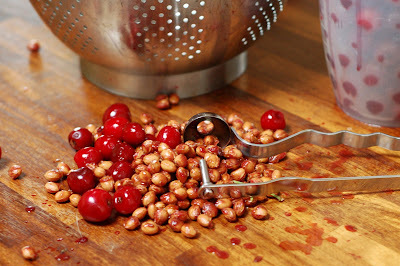 Over the last few days I have removed the stones from 3kg of cherries. It takes an alarmingly long time. The kitchen and I have looked like we may be starring in a cheap horror movie, red stained fingers and impressive splatter marks. It's a gory business. 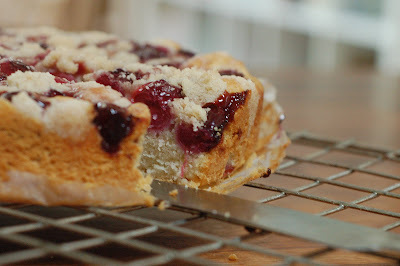 I have bottled, made jam, made muffins, made more jam and made a cake. 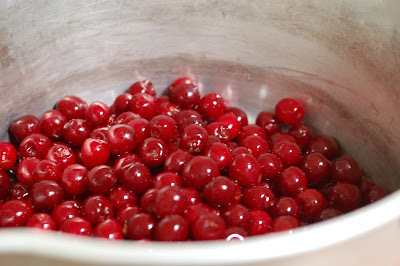 I intend to freeze some for future winter clafoutis, the sweet red taste of summer will be such a treat in the dark winter months. But I need more ideas, the branches of the trees still weigh heavy and I am concerned that if I wait too long before using my cherry stoner again my hand might altogether seize up. The soft fruit harvest has been spectacular here this year - but no cherries. You're very lucky, juice splashes and cramped hands and all! We don't have a cherry tree so I get the cherries allready pitted from the grocery. 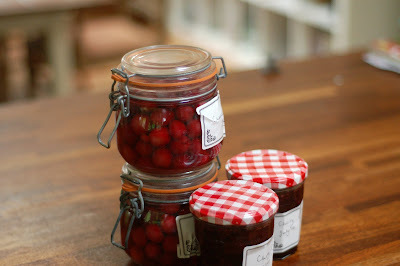 One year I made loads and loads of cherry jam, a low suger version and we enjoyed it all winter. Brandy cherries is a great treat too around christmas. Wait, did you say the cherry tree IN YOUR GARDEN? Oh, you lucky thing. I love cherries and can't imagine the delights of actually having a whole tree of them out the back door!! All your cherry creations sound wonderful! I have had good results bottling all sorts of fruit - rhubarb, damsons and raspberries in vodka and gin. Could you also make a cherry cheese (like damson cheese) to serve alongside cheese or ham? Cherry tree in garden - so jealous! Otherwise, just google Julia Child Clafouti and you can find her cookbook online. Yum, yum, yum! I love cherries and your baking looks delicious. I would like to try your cherry jam because it seems delicious. I can only imagine the labouring, picking, pitting and cooking. Oh, I wish I had a prolific cherry tree!! It's on the one of these days list... It may never happen, but I did just get hooked up with a bulk fresh fruit supplier and picked up my 1st Rainier Cherries today! Yummo! wow! this all looks amazing! My mouth is watering just looking at all your wonderful pictures... yum! okay. how wonderful that you have a cherry tree!!!!! and you know what i would love... to have coffee and a piece of that cake.... along with a little knitting!!! Oh, yum! I adore cherries but they're so expensive. Having a tree in your garden must be heaven. Those cherries look amazing! Beautiful photos. Growing up my Aunt would can cherry juice and at the bottom of the jar would be a lovely pile of cherries but now when I think of it she might have just canned the cherries pits and all and we just thought she was making juice. They were lovely to look at and even more enjoyable to eat.